Diadochi - On his death bed, when asked who should inherit his kingdom, Alexander reportedly said, "To the strongest", indicating that his empire should go to the one who could take it. And there was no shortage of would-be successors. 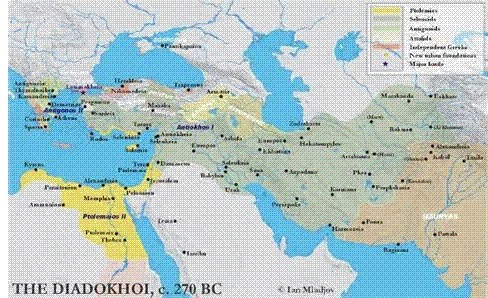 In ancient times, the spoils of conquest typically went to those who could take it by force, and in the absence of a named successor, the outbreak of war was the only alternative to a peaceful transition following Alexander's death. Diadochi is Greek for "successors" and represents a series of battles that followed over the next quarter century. Virtually every one of his generals made a play for Alexander's kingdom. At first they tried to establish a right of succession, but the plan quickly broke down and conflict became inevitable. Before that happened though, they did succeed in dividing Alexander's empire into satrapies, and each general claimed a different section of it. It was not just Alexander's generals though. After the division of the empire, some of their own commanders got in on the action as well. But by 320 B.C., the contestants had essentially been winnowed down to five; Ptolemy I Soter in Egypt, Antigonus I Monophthalmus (the "One-eyed") in Phrygia, Cassander (son of Antipater, one of Alexander's generals) in Macedonia, Lysimachus in Thrace and Seleucus I Nicator in Babylonia. Seleucus was initially only a minor figure in the Diadochi and was nearly eliminated in 316 after Antigonus invaded Babylonia. However, he fled to Egypt and sought refuge under Ptolemy I, which he was granted. He returned to his seat of power in 312 and began expanding his empire, eventually establishing the largest of the successor kingdoms. However, in 315, it was Antigonus I who was most powerful and had the best chance of ruling Alexander's kingdom in its entirety. But his strength was also his undoing. The remaining powers, Ptolemy, Cassander and Lysimachus allied against Antigonus. In 306 B.C., Antigonus attempted to land a fatal blow to Ptolemy by invading Egypt. By this time Antigonus was well into his seventies and his son, Demetrius was commanding his military. 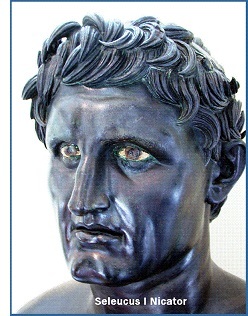 Ptolemy repelled the invading army, but both empires were severely weakened. The other kingdoms seized on this opportunity. In 301, Cassander, Lysimachus and a resurgent Seleucus, invaded Phrygia and attacked Antigonus at the Battle of Ipsus. It was the most significant conflict in the Wars of the Diadochi. Antigonus was defeated and killed, his kingdom ceased to exist and his land was divided between Lysimachus and Seleucus. Demetrius survived, but was without a kingdom and essentially retired to Ephesus. Cassander died only a few years after Ipsus in 298 B.C., and after his death his empire pretty much collapsed. So Seleucus, who started in the most precarious position, survived and established both the Seleucid Empire and dynasty in Asia. Ptolemy did the same (called Ptolemaic) in Egypt, and Greece regained some semi-autonomy in Europe.